WASHINGTON ? The new roles assigned to NASA?sfield centers by space agency chief Charles Bolden this week favor facilitiesin states likely to lose thousands of jobs if Congress approves the agency?splan to cancel the Constellation program, a 5-year-old effort to replace thespace shuttle with new rockets and spacecraft optimized for the Moon. 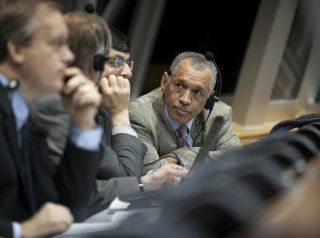 Bolden?sThursday announcement came one week before U.S. President Barack Obama isset to deliver a ?majorspace policy speech? at the agency?s Kennedy Space Center in Florida, whichstands to lose thousands of jobs when the space shuttle is retired later thisyear. But while the new program assignments could pump billions of dollars intoFlorida and other states that were counting on Constellation to stempost-shuttle job losses, Bolden said it is too soon to know how many aerospaceworkers would find employment under Obama?s plan. ?We have more money, and that would say thatyou have more jobs,? Bolden told reporters during a teleconference. Bolden saidthe agency has not conducted an independent assessment of estimated job growthunder Obama?s plan, but correlated an increase in NASA?s contractor work forceto the president?s proposed $6 billion funding boost for NASAover the next five years. ?If we use the standard measure for future jobsas money, then yes, there should be more jobs.? Obama?s $19 billion NASA budget request wouldincrease the agency?s top-line spending by 1.5 percent next year followed bythree years of better-than-inflation boosts. While that translates to $1.6 billion morefor NASA between 2010 and 2013 than the previous administration proposed, thepart of the agency in charge of Constellation ? the Exploration Systems MissionDirectorate ? would see its budget shrink by $5.2 billion compared withprevious plans. Although Obama?s plan has come underbipartisan fire from Capitol Hill, Bolden said if Congress approves hisagency?s 2011 spending plan, NASA would stand up a new program office atKennedy to manage $5.8 billion aimed at fostering development of commercialspace taxis over the next five years. In addition, Kennedy would get $2.3billion over the next five years for infrastructure improvements to the EasternRange launch complex. Houston-based Johnson Space Center, whichcurrently has overall responsibility for the Constellation program, couldmanage a $6 billion flagship technologydemonstration program focused on projects costing up to $1 billion. NASAintends to initiate demos next year focused on in-orbit propellant transfer,inflatable space modules, and rendezvous and docking. NASA?s Marshall SpaceFlight Center in Huntsville, Ala., which stands to lose its lead role on theAres rockets and Altair lunar lander programs, would get four new program offices,including one in charge of a $3.1 billion initiative to research and developheavy-lift and other rocket propulsion technologies. Dale Ketcham, director of the SpaceportResearch and Technology Institute at the University of Central Florida, said despitethe loss of Constellation, NASA?s new direction could still generate jobs forFlorida, Alabama and Texas. ?Government contractors are generally goingto locate their commercial activity where the procurement authority exists,?Ketcham told Space News April 8. ?If it becomes clear that this is wherethe vast majority of the long-term future of activity is going to occur in theU.S., then the marketplace will usually respond to where it?s cost effective todo business.? Some private space firms are alreadyincreasing their presence near the U.S. Air Force?s Cape Canaveral Air ForceStation in Florida, where Hawthorne, Calif.-based Space ExplorationTechnologies (SpaceX) is planning the inaugural launch of its new Falcon 9medium-lift rocket in May. Lawrence Williams, SpaceX vice president ofstrategic relations, said the company has big plans for the state, includingpossibly refurbishing the first stage of the Falcon 9 and its Dragon spacecapsule there. ?It?s something we?re looking at,? Williams saidApril 8. Williams described the company?s growth inthe state as ?very aggressive? and said the trend is likely to continue if NASAstands up a commercial crew program office at Kennedy. ?There are a lot of factors about where weput our facilities, but the customer is certainly one of them, and one of theprimary reasons SpaceX chose to launch out of the Cape is because both NASA andthe Air Force are there,? Williams said. In addition to attracting commercialspace companies to Florida, Ketcham said, the plan to give Kennedyacquisition authority over commercial crew programs diversifies the center?sportfolio. ?This will enable us to move forward whereKSC?s business model is not just [launch] operations but alsoresearch-and-development and technology components, so our business case isbroadened and we?re not hammered again in the future,? he said. But Rep. Bill Posey (R-Fla.), a staunchcritic of the new direction, was underwhelmed by NASA?s program officeassignments. ?There is really nothing new in today?sannouncement,? Posey said in an April 8 statement to Space News. Posey questioned why the program officeassignments overlap. For example, while NASA?s new commercialcrew program office would go to Kennedy, program oversight would be sharedwith a deputy program manager at Johnson. ?Do they expect each center to fall forthat?? Posey asked. During the April 8 teleconference, NASADeputy Administrator Lori Garver said the NASA assignments overlap in order tobuild on existing strengths at each field center. ?So keep in mind that even though a programoffice is based at one center, the work of each program is often a NASA-wideeffort,? she said. Sen. Richard Shelby (R-Ala.), anotheroutspoken critic of the Obama proposal, said despite shifting $7 billion in newprogram office funds to Marshall Space Flight Center, the new work assignmentsare nothing more than ?a plan to rearrange NASA bureaucracy.? ?Now that the Administration has finallyreleased its planned program assignments, it is clear that this is the end ofAmerica?s leadership in space,? Shelby said in an April 8 statement to SpaceNews. Rep. Robert Aderholt (R-Ala.) said theprogram assignments don?t make up for the loss of Constellation. ?I still firmly believe that the Obamaproposal is the wrong direction for NASA?sspaceflight program because no clear direction is the wrong direction,? hesaid in an Friday statement. Rep. Pete Olson (R-Texas) said in Thursdaystatement that Bolden had called before the teleconference to inform himJohnson would continue to be the home of mission control for human spaceflight. ?I appreciate that assurance, but the factremains that this budget proposal still contains no options for humanspaceflight, so what missions will [Johnson] control?? Olson asked, adding heplans to lobby fellow lawmakers to support Constellation. Some Florida lawmakers, including Sen. BillNelson (D) and Rep. Suzanne Kosmas (D), welcomed NASA?s decision to locate theCommercial Crew Development Office at Kennedy but said they would like to seeNASA do more. ?NASA still needs to evaluate thecontinuation of the shuttle program to fully service and support theinternational space station and still needs a clearly defined vision for thefuture of human spaceflight with set goals, timelines and a next-generationNASA-led vehicle,? Kosmas said in an April 8 statement to Space News.